The Johnsburg Community Club has a 1000 square foot Armed Forces Flag Memorial on their property located 2315 W. Church Street. It incorporates the flags of each armed service, the American flag, our state flag and POW flag. Monies raised from this “MILITARY HONORS” program will be used for paving this plot with the personalized engraved bricks, as well as future upkeep, lighting, and flag replacement expenses. Johnsburg Community Club made a donation to the Johnsburg PTO regarding their annual PTO Trivia night, November 12th, 2016. From left to right: Jeff Meyers-JCC Treasurer, Dawn Barrett from the PTO, and Clark Bierman, JCC President. Matt Colby presents a check on behalf of the Johnsburg Community Club to Ken Calhoun of the Johnsburg Junior Skyhawks. The JCC made a $710.00 donation to the Junior Skyhawk Organization. A short video/slide show from Walla-Pa-Looza 4 at the Johnsburg Community Club on July 28, 2012. 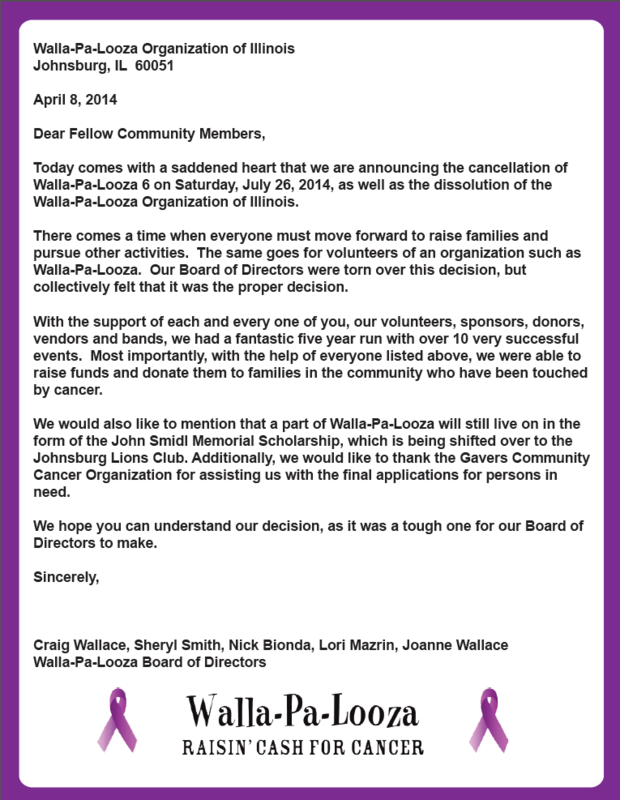 To learn more about the annual Walla-Pa-Looza music festivals, "Raisin' Cash for Cancer" visit their website.